The latter part of 2015 was not especially kind to me. I had a serious surgery in September and in November I suddenly fell ill once again and suffered a somewhat sustained period of time in the VA hospital, about 45 days all told. I am now home and greatly improved, Thank You very much. I mention that only because it reminded me of a time long ago and the special folks who endeared themselves to me. Never, in our glorious past has any one group of individuals EVER earned the respect and the admiration of Marines across the globe than our FMF Navy Corpsmen, more commonly referred to as “Doc.” Most folks have no idea what these brave men have endured just to be called Doc. They train with the Marines, they deploy with the Marines, and they patrol with the Marines. They are as much a Marine as anyone can be without actually enlisting. Not a patrol goes through the wire without Doc. Doc is everywhere. He was on the beach at Tarawa and on every island campaign in the Pacific. There was even a Doc who helped raise the flag on Iwo Jima. Doc was at the “Frozen Chosin” Reservoir when Chesty Puller’s men were withdrawing through that awful frozen (-30) tundra of North Korea. Doc not only tended to the wounded but was required to deal with many horrific amputations due to frostbite. Sometimes they had a real M.D. to help, but not very often. 2 January 1968. Bravo Company, 1/26 had been deployed Oct-Dec to 881 South. When we left the hill the day after Christmas, 1967, we ran a long operation up the Rao Quan River to the north. It was January when we got back and were assigned to the combat base. The NVA had broken a truce (SOOPRISE) and we were called back to the base. We sacked in with Alpha Company on the north side of the runway. By midnight, Danny Horton and I were delirious. We had not used our purification tablets which made our water non-potable, and as a result were really sick. John “Doc” Cicala, US Navy Corpsman with Bravo Company, 1st Battalion, 26th Marines at Khe Sanh. Our platoon sergeant, Staff Sergeant Gus Alvarado, was dispatched to tend to us and we were taken straight away to a tent. A firefight had just erupted with members of Lima Company close to the tent we were in. I was so sick I never moved from the table. Everyone else was on the ground. This was the beginning of my very first hospital stay, if that is what you would call it. I think I was there 16 days, maybe. They finally said we had amoebic dysentery. It can kill you if not properly treated. But Doc was there. This tent was known as the BAS, Battalion Aid Station. It was a dark, sandbagged hole in the ground. I don’t remember much of the first ten days but I know Doc took wonderful care of me. Soon I was discharged from BAS and sent back to Bravo. I was very weak. I would see or hear about Doc’s brave actions many more times during the Siege. You see, the reason Marines love Doc is because they know that if they take a bullet, if they lose a limb to a mortar round and call for Doc, he will come, just like he has always done. It makes no matter how heavy the volley, Doc will charge into the guns to tend to his wounded Marines. He has always done so and he continues to do so to this day. Make no mistake, Doc for sure is one of our most unsung Heroes. Doc Cicala from our 3rd Platoon, Bravo Company, is a fine example. Shot through one of his lungs and with grenade fragments to his groin, he still continued on the day of the 25 February ambush doing what he could to help guide others who were literally crawling back to the perimeter on their stomachs. Second Platoon’s Doc Thomas Hoody, who spent many nights braving the incoming artillery patching up Marines, would visit me in the night twice during the month of March to check on my wounds. I am sure the Docs in first platoon showed every bit as much raw courage and bravery as well. But one of the most searing moments of my tour came on 30 March when Doc and I met up close and very personal when our roles were reversed in the middle of one of the bloodiest damn firefights of the entire war. Richard Blanchfield had served better than 6 years as a United States Marine. He got out, enlisted in the United States Navy and became a Doc. He was a replacement for the Third Platoon on 30 March. He had only been there a few days at the most. I didn’t even know him. By the time I met him, the entire company was at “Fix Bayonets” and we were definitely engaging Charley. In fact, we were all in a virtual dead run to get these guys who had killed so many of our fellow Marines. Doc Blanchfield was well ahead of me. He had already tended to a wounded Marine and had just got up on the edge of a bomb crater when mortars simply rained down on him and the whole command group as well. When I reached the edge of the crater, he was about halfway down and sliding in the loose dirt. There were two dead Marines and numerous dead NVA in the crater. Those two Marines certainly earned their pay that day. Doc had, by this time, stuck 2 morphine needles in his own leg. His arm was nearly blown off at the shoulder. At first I was in as much shock as he was, but I regained my composure and began to tie him off. After slowing down the bleeding, I tied two battle dressings together and wrapped him all around so he at least wouldn’t do any more damage to what was left of his arm. I thought he would die. The battle was still in full assault so I laid him back and comforted him as well as I could and left him. I have not seen him since but he did survive and miraculously his arm was saved. 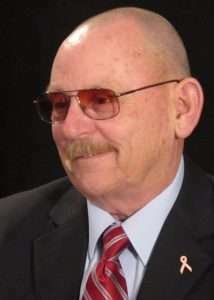 After getting involved with the Khe Sanh Veterans in 1992 I found out Doc Blanchfield was living in Oceanside, California. We talk once a year on the phone. He has never failed to send me a card for each and every holiday since that first call. I still have not seen him. He was very pained by what happened to him and I understand. He did say Thank You that first call. Like I said earlier, I was in the hospital over this past Veterans Day holiday. Most folks understand that 10 November is the Marine Corps Birthday, so we were also celebrating 240 years of glorious history. That is a very long time for sure, a time in which we have come to celebrate the lives and courageous acts of many from our ranks. I could write pages, even a book or two recounting all of our Heroes for sure. A wheelchair-bound Marine (a volunteer) was my only visitor on this Marine Corps Birthday. He had lost both legs in Vietnam. We had a grand conversation. He brought me candy, S/F. I have read a great deal about the wars of the last ten years and the men who have gone in my stead now that I am old and grey. Don’t ever let anyone tell you this generation is lost. I am just as proud of our young Marines today as I ever have been. And never forget this: Wherever you find these Marines, you will find Doc, ready, willing and able to charge into the guns if necessary. He will, as he has always done, come when he hears the word Doc. Guest blogger Michael E. O’Hara. Semper Fidelis to our Navy Corpsmen everywhere you serve. 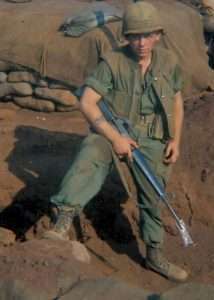 Michael E. O’Hara served with 2nd Platoon, Bravo Company, 1st Battalion, 26th Marines at Khe Sanh during 1967 and 1968. He earned three Purple Hearts. 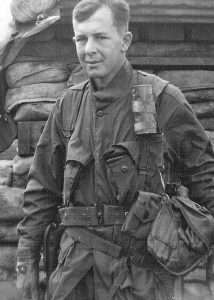 Michael E. O’Hara at Khe Sanh. If you or your organization would like to host a screening of BRAVO! in your town this winter, spring or summer, please contact us immediately.